SW10 – where does it fit in? With three SW liquid spray protections to choose from in the Scholl Concepts armoury, it’s useful to understand the distinct benefits of each one. Following our blog posts on the qualities of No Gloss and NEO, I thought it was time I revealed the true value of the first of the three SWs – Scholl Concepts SW10 Premium Finish Spray. The benefits of SW10 are the least obvious of the Scholl Concepts SW range, but it is a superb speed detailer with specific advantages. Described as a ‘premium finish spray’, unlike its SW20 and SW40 speed wax counterparts, SW10 cleans as well as seals treated surfaces. So much so, should you choose, its combined formula of valuable oils and state-of-the-art polymer technology can be used as a waterless wash on lightly soiled surfaces – removing grime and sealing simultaneously. Although good on paintwork, it really shines (excuse the pun) on chrome, polished steel and other high gloss surfaces, leaving a five-star-rated (brilliant) gloss level – higher than that of SW20. And with a four-star-level protection rating (high), its durability is also impressive for a ‘speed wax’. We have a hunch that Frank Scholl’s love of the Harley-Davidson could have played a part in the development of this product as it is perfectly suited for use on motorbikes! SW10 is excellent on glass, in addition to paintwork and metal parts, and even makes a handy clay bar lubricant. 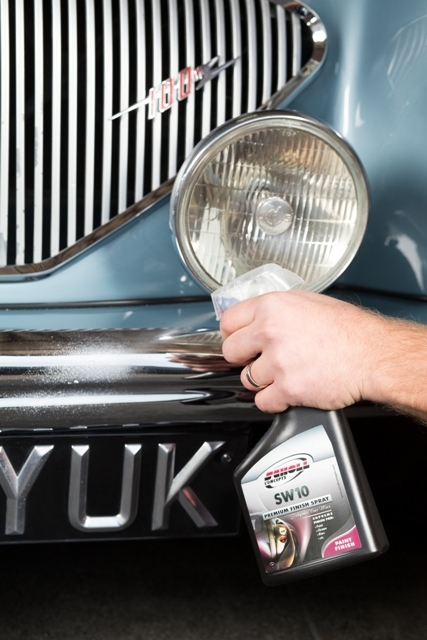 I use SW10 for removing stains on chrome, cleaning badges on bonnets, wheels, door shuts and around hinges. A quick spray-on and microfibre-off and the results speak for themselves. Like all Scholl Concepts products, a little goes a long way. An even application is all that’s needed and its silicone-free formula makes it bodyshop friendly, too. Charles Dujardin of Auto Wax Works is a professional detailer and valeter and a fully qualified paint refinisher with over 10 years' experience. Charles combines an in-depth knowledge of paintwork with detailing skill and a genuine appreciation of Scholl Concepts high performance products. His detailing studio is near Milton Keynes, Buckinghamshire.